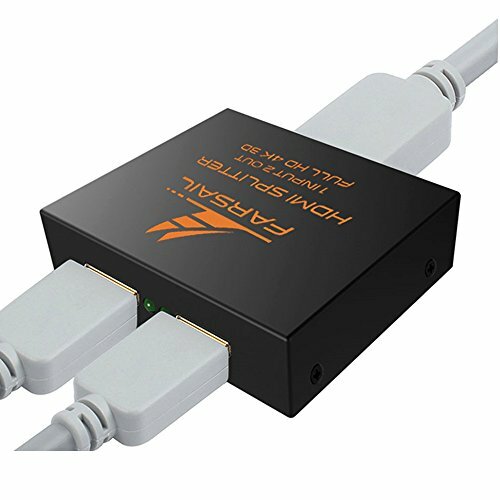 1x2 HDMI splitter distributes 1 HDMI source to 2 HDMI displays simultaneously. It offers HD video solution for super market , shopping mall. HDTV, STB, DVD and Projector factory, noise, space and security concerns, data center control, information distribution, conference room presentation, school and corporate training environments. what's the difference-Hdmi switcher vs splitter : This isn't a "switch." It is a TV splitter, TV Splitters are used to split an identical signal to run to several displays. Hdmi splitter 1x2 means hdmi splitter 1 in 2 out. Same signal but "split"to 2 displays. But hdmi switch, it just switches the signal on one display. In order to protect the splitter and your devices, Please make sure the splitter is powered off before you attach in or extract video source and displays, Please insert and extract HDMI cables gently. PLEASE USE V1.4+ HDMI CABLE. If you have any questions about this product by FarSail, contact us by completing and submitting the form below. If you are looking for a specif part number, please include it with your message.